Big Bash League(BBL) head Kim McConnie has termed Indian Premier League(IPL) as the best domestic T20 competition in the world and feels there is a lot that other tournaments can learn from the journey and success of the marquee event. McConnie joined Cricket Australia from PepsiCo, where she was Head of Sports Marketing at the company's global headquarters in New York, last year and was appointed in her current position with an ambition towards the betterment of the women's game in the country. Speaking about the Indian Premier League(IPL) and how it has set the benchmark for other cricket competitions, McConnie was quoted telling PTI as, "Hats off to IPL. It is by far the best domestic competition in the world, We often say that BBL is being used as a launch pad where cricketers around the world can showcase their talent and hopefully put them into a good place for the IPL", and said, "IPL has shown the roadmap for the other leagues in the world. We pay great attention to the IPL and notice what they are doing especially from the talent point of view. It will continue to lead the way in many factors,"
"We learnt from the IPL many things like fan engagement. Lot of our players come back with a lot of great stories from IPL. We have borrowed from IPL the concept of merging sports with entertainment and now BBL is like family entertainment where whole family come and sit together to watch matches," she added. 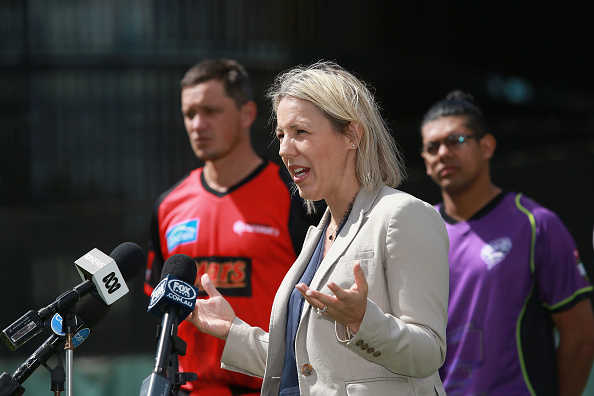 Although, she is quite pleased with the way BBL is gaining immense popularity every year and is satisfied how the women's game is getting enriched through the WBBL. "We are moving into eighth year of BBL and have shown rapid growth. We are now able to fill stadium like MCG with 60-70 thousand people coming to watch BBL games, Players like Ricky Ponting are talking about it and it is now seen on the global scale as a dynamic domestic league." she said and added, "WBBL is into the fourth season and it is the best women's league around the world. We are very proud that some of Indian female players are also a part of it. It is very dynamic and gaining a lot of interest and I am sure it will lead the way for others." Further, on the plans of increasing the number of BBL matches and venue spread in the country for it, McConnie dwelled, "This season is full home and away and we are having 16 extra games. This will lead BBL to new destinations, new markets and new fans. BBL matches will be held in Gold Coast, Geelong, Canberra, Alex Springs for the first time,"
"Leagues like BBL and IPL are very important for the game of cricket. Our aim is to inspire the next generation to pick up cricket bat may be in the backyard, whether in our formal participation programme or beach Cricket," she said in conclusion, "We have 1.5 million kids playing cricket and one third of them are girls. The growth is phenomenal. We are making it sure that all the kids across Australia have the ability to play cricket where and when they want."